The first of several Deadlands one-shot comics hits shops today. Thanks to its creative mixture of Westerns and Horror (resulting in awesome monsters like man-eating tumbleweeds and ghostly hangmen) as well as Steampunk, Deadlands was one one of my Top Five role-playing games back when I used to play. One of my criteria for an excellent RPG was an extremely developed world to play in and Deadlands had that in spades with its wide swaths of Indian-controlled territory, outlaw settlements (based on real, Western towns), and a maze of pirate-filled waterways where California used to be. There's a ton of story potential there for some truly awesome comics. Ron Marz is editing the series of one-shots and has hired creators like Steve Ellis, Jimmy Palmiotti, Justin Gray, Bart Sears, Steve Niles, and Francesco Francavilla to contribute. I lamented on Robot 6 that I wished it was an actual series with characters I could get to know instead of a series of one-shots, but C Edward Sellner, Creative Director for the studio that's producing the book assured me that they're "just warming up with these first one-shots, to introduce the world and the property to the comics fans. We have plans a’plenty for more Deadlands goodness, including more traditional mini-series and if sales warrant, even a monthly dose with an ongoing character you’ll meet in these first one shots." Sounds good to me. 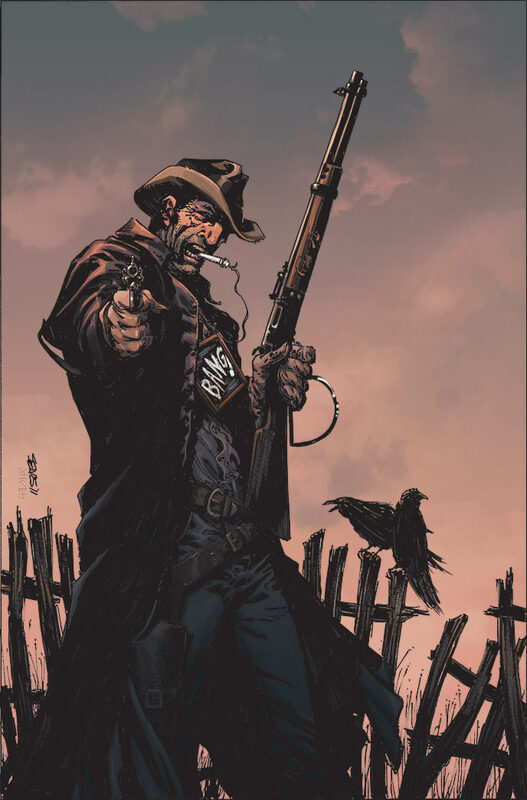 According to the press release: "The first book out of the gate is Deadlands: The Devil's Six Gun by the Harvey award-winning team of David Gallaher and Steve Ellis. In classic Faustian tradition, a weapons maker comes to America to pursue the American dream in the former colonies. Instead, he becomes immersed in plots and manipulations to gain unearthly power through the supernatural Ghost Rock. His goal? To make a gun that can kill anything, including the powerful Hellstromme! Its a journey that will cost him everything he loves, including his soul! "Deadlands (APR110410), the first 32 page full color one shot in this series of weird westerns, will be available in stores June 15, 2011 for $2.99." I've liked Deadands since the first RPG was released. I've even run a couple campaigns of the game. I honestly hope they stay away from the games major plot players though. I always liked the smaller stories then the overall meta-plot of the setting. I didn't run our Deadlands campaign, so I don't know much about the meta-plot, but I agree with you on principle. I ran lots of other games that had meta-plots and I'd try to reflect those in the campaign without making the campaign about those plots. I'd usually try to find an angle where the players could affect or touch the meta-plot without making the whole thing hinge on them. I hate campaigns where the players feel forced to make particular choices to fit a preconceived story. I don't know for sure, but I think our Deadlands GM pretty much ignored the meta-plot. Or - more likely - enough time hadn't passed within the game for us to notice that there was one. The last campaign I ran was actually very supernaturally light at first. That way when they started actually seeing skeleton gun fighters it had quite the impact. That's a great way to do it. Our GM really knew how to run a horror game too. It was mostly typical Western adventure, but there'd always be some kind of mystery and building dread until we finally faced the supernatural menace (which by then we'd built up in our minds and were truly afraid of).